Vinsanity was spreading like a wildfire after Vince Carter’s spectacular rookie season — which was only 50 games because of the NBA lock-out. Not since Shaq entered the league in 1992, did we have a first year player dominate the nightly highlights shows with so many memorable dunks. But Shaq’s most memorable dunks in 92 involved him going through defenders and taking the rim down to the ground, while Vince’s most memorable dunks involved him getting up way, way, above his defenders and the rim. During the summer of 1999, Vinsanity hit New York the same day a severe thunderstorm did. 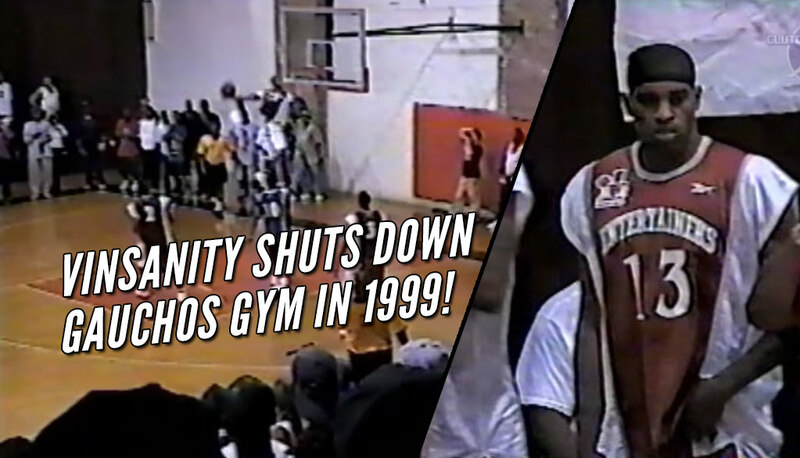 A storm so bad that the EBC had to move it’s Rucker Park game indoors to the Gauchos Gym. Standing in the rain to go into a gym that’s over 100 degrees with 2,000 other people doesn’t sound that appealing, but you wouldn’t have found a person in the crowd that day who would have said they regret going. So the rumors of his Rucker Park debut echoed throughout the city’s entire summer basketball community. The Vacant Lots team was undefeated that summer, headlined by Charles Jones, who’d led the nation in scoring for two consecutive years at Long Island University. They opened the game by scoring ten consecutive points and despite the standing-room-only crowd, the mood was relatively subdued because Vince Carter was nowhere in sight. With that utterance, the crowd became instantly frenzied as Carter came jogging through the locker room doors attired in a white and brown Black Hand uniform. He waved at the crowd, which included Jay Z and his fellow NBA brethren Ron Artest and Stephon Marbury, and ran directly to the scorer’s table. More concerned with fitting in than taking over during the early stages of the game, Carter did nothing to distinguish himself in the first half. But at the beginning of the second half, he alerted air traffic control that he was ready for takeoff. His first bucket came with under nine minutes left in third quarter, when he grabbed an offensive rebound and elevated for a two-handed dunk in the paint. Within a matter of seconds, he drained back-to-back three-pointers from way beyond the arc. 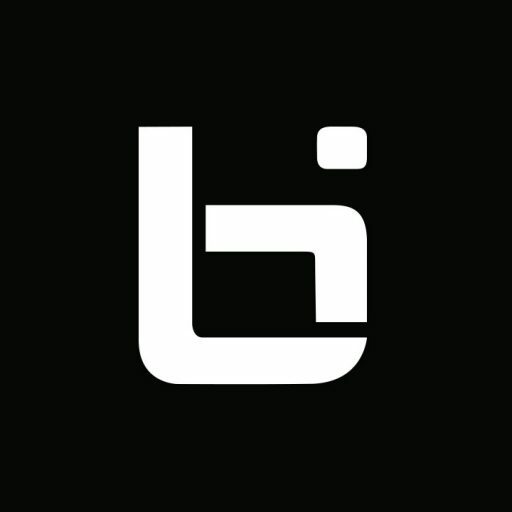 “With 6:28 left in the third, Air Canada broke into the open court, slipped past one defender with a right-to-left, behind-the-back dribble, whipped a behind-the-back pass to a trailing Prime Objective (the Washington, D.C. playground phenom whose real name is Lonnie Harrell), pointed north, and as an alley-oop pass came falling out of the sky, turned his body 180 degrees in midair so that he was facing the opposite basket, caught the rock, and threw it down with a force that literally shook the Rucker faithful out onto the floor in celebration. At this time, I was running the most popular Vince Carter fansite on the web (GotVinsanity.com) and when I heard about this game, I had to have a copy of it so I could share it with the rest of the world. 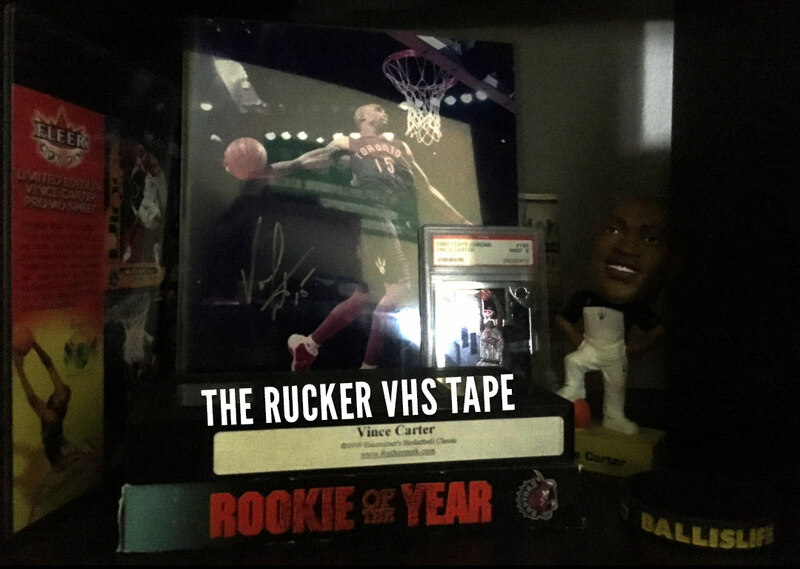 Lucky for me, the EBC was selling VHS copies on Ebay and it remains one of my favorite Vince Carter collectibles. Here’s some of the best highlights from the game, which includes the famous windmill alley-oop dunk and him and teenage Adrian Walton aka Whole Lotta Game going at. If you want to know more about Walton — who Fat Joe believed should have been in the NBA — you can check out this episode of Heart Of The City featuring Walton and God Shammgod.